Making an alien-zombie-vampire-werewolf-plantsim-witch hybrid has never been this easy. 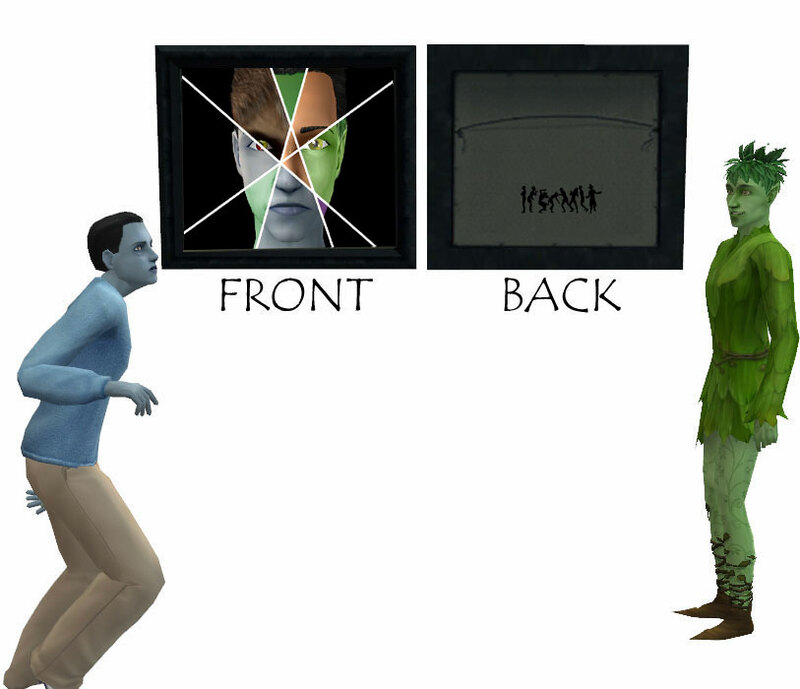 This magical picture can transform (and cure) your sim to any of the creatures, except servo, bigfoot, and genie (obviously). But you can spawn them, though. Of course, you need appropriate expansions for the creatures transformation. The options will appear accordingly to the EP you have installed. For example, if you don't have Pets then the pie menu "turn into werewolf" and "cure lycanthropy" won't even appear. 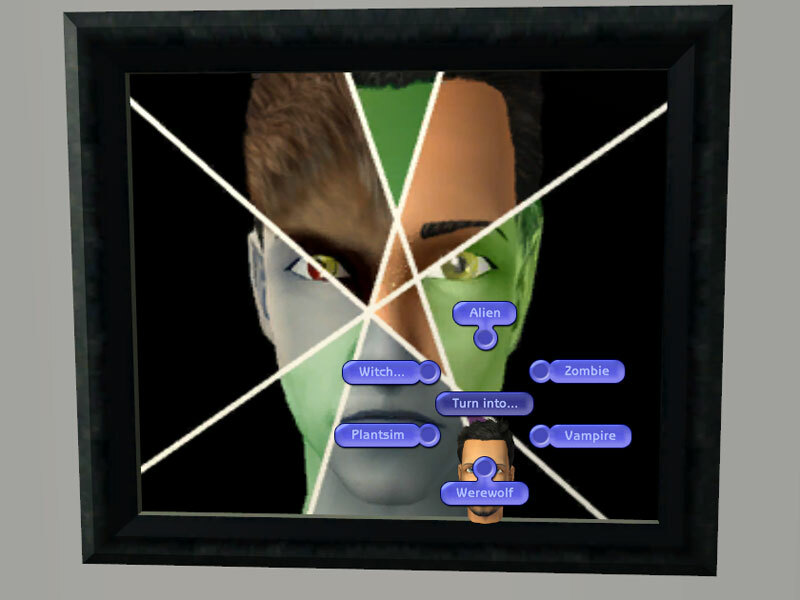 -Transform your sim into zombie, vampire, werewolf, plantsim, witch (infallibly good, good, nice, neutral, mean, evil, atrociously evil), and alien. 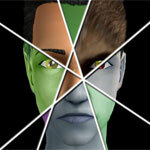 -Cure your sim from zombiism, vampirism, lycanthropy, plantsimism, witchery, and alienism. -Spawn servo, bigfoot, and genie lamp. -All wants and fears related should be satisfied. And oh, toddler plantsim can be cured using this painting. Figured it worth pointing out as it annoys me a lot that you can't cure a plantbaby without any hack/mod. Also, a normal toddler can turn into a plantsim. As requested, I added the options to spawn servo, bigfoot, and genie lamp. As for the alien transformation, it's experimental as it's not even available in the game originally. Note that the eyes don't change to black, but stay in their original color. Unnecessary pie menus wouldn't show up all the time (except for the alien-related options). For example, if a sim is not a plantsim, pie menu 'cure plantsimism' wouldn't show up for him, and if he is, 'turn into plantsim' wouldn't show up. Also, alien and plantsim pie menus are no longer available for Servos and bigfoot as they cannot become one anyway. Werewolf and vampire pie menus also wouldn't show up for bigfoot. This picture can be found in the decorative section at the price of a whopping... 1 simoleon. Cloned from a base game painting "The Lone Daisy". Alien options always show up regardless of the sim's current state. - Fixed some memory bugs. - The object will no longer go down with the walls. - Fixed a bug where the game will throw an error when curing a zombie without BV installed. - Added options to turn into witch and to be cured from witchery. - Added the zombie options for those with AL but without UNI/FT. - Fixed servo's cure vampirism bug. - Young adult and bigfoot locomotion no longer revert to adult's when cured from zombiism.